It’s been nine and a half years, almost, since he died, and though I wrote a book of poetry called Companion Spirit about his continued presence in my life since then, it still sometimes surprises me when he turns up. Like Monday morning, for example. I awoke with that feeling that he and I had just been talking, having a good conversation in some lovely spot. I had no idea what we talked about, but his presence was as warm, as comforting, as the summer quilt atop me. I could feel his presence, barely hear his voice as morning pulled me into wakefulness. A visit with my best companion spirit always feels like that. So it was that, before a shower, before yoga with Pamela in my back yard, I went to my office and retrieved a round hat box. Two years ago when my niece Lauren moved in, I had deposited these items in that hat box for safekeeping. 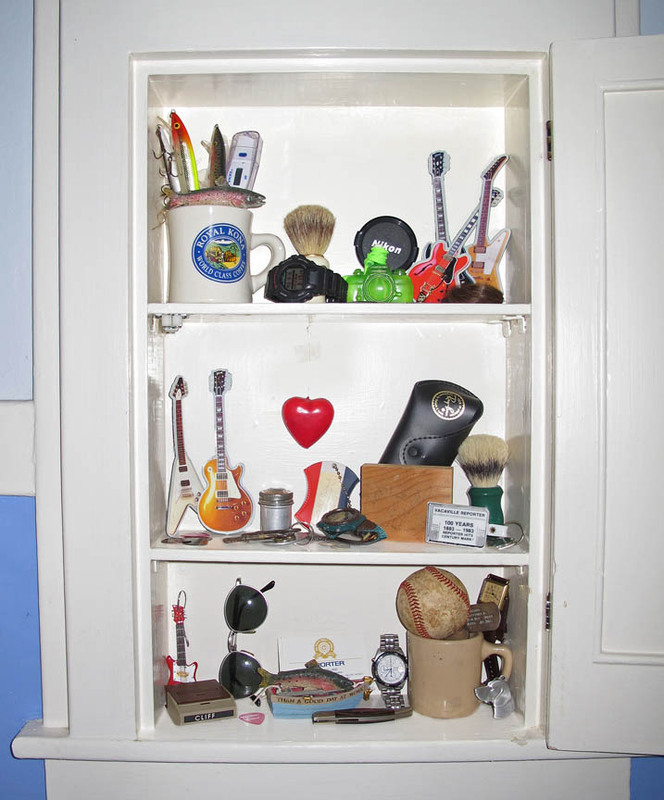 Now that Lauren has left to make her own life in her own apartment, the medicine cabinet in her bathroom is vacant. I knew what I needed to do. Right then. I opened the hat box and took out the treasures, one by one: a scuffed hardball; his last coffee cup; a small key ring with two skeleton keys from his old family home; the last bits of his graying hair; fishing lures, guitar picks, two shaving brushes, a luggage tag, four watches, his sunglasses, a pocketknife, his Coast Guard dogtag, and a square block of wood that he signed, “First cut on new table saw. Love, Cliff.” He did that because I asked him to. I gathered up all these little tokens of him and put them in the old wooden medicine cabinet because that was his bathroom for so many years. It seemed an appropriate place for an impromptu altar. I’ve wondered over the years how many guests go into that bathroom, open the medicine cabinet (c’mon, you’ve peeked in medicine cabinets in other people’s houses, haven’t you?) and are startled by what they see. If they look carefully, they’ll see his business cards from The Reporter, the newspaper where he worked for twenty years. They’ll see a half dozen little guitars—five of them magnets, one an ornament—because he played the guitar in his later years. I imagine him wailing out rhythm behind great lead guitarists in his heaven. He’d like that. I hope that his heaven has good old dogs and calm fishing holes and a fine woodshop for furniture making in it. I hope there are ripe wine grapes all the time to crush and bottle, as well as heady hopes to make beer. I hope that his heaven has all the best things of his last lifetime, including some of his favorite people, as well as the dogs and cats that preceded him. And I hope that if we do get other lifetimes, his next one is much easier, with a strong, healthy heart, and simpler path. He so deserves that. He put up with me for more than seventeen years of marriage, and I did not make it easy. I still miss him, and when I do, I can again go to the medicine cabinet, open it and pick up, say, the baseball or one of the guitar picks or his dogtag. And the companion spirit instantly blooms in my heart, in my head, saying something like, “Now Toots…” He’s still my old friend, one who knows me better than most, and he’s still in my life. It was a great surprise to learn that—the dead loved ones return when we need them or want them, too. They’re never very far away, it turns out. And if we’re very quiet and still, as in sleep or meditation, they make themselves known. I am grateful—beyond grateful—for everything Clifford Ernest Polland gave me and continues to give me. Not the least of which, even from that place just beyond the veil of what I think of as “here,” is his undying love. Gorgeous Jan! I cried. Good writing. A lovely memory of Cliff. Awwwwwww. Sniff. I miss him too! I will always remember the thoughts he put in my head shortly after he died. Really, Really, Really nice, Jan. Thanks for the memory perspective. I sometimes really, really, really need that too. Great shrine. I go to the bench. “There” was important. “Here” is important. Understanding the difference is vital. Appreciating the love is honor. That’s my take.